Many state and local codes consider a building's wall-to-window ratio in determining its energy efficiency. Building codes vary between jurisdictions. 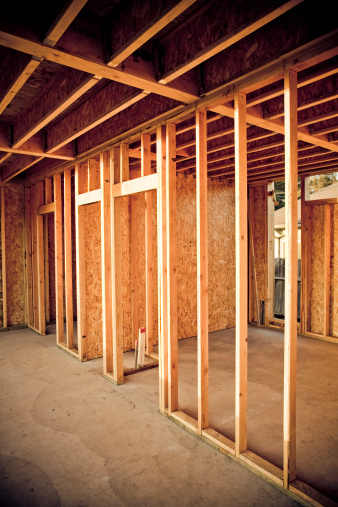 You may have to calculate a building's wall-to-window ratio to ascertain what additional insulation is required to meet your local building code. You can determine this ratio by taking some basic measurements yourself, without the assistance of a professional. Measure the length and width of each exterior wall of the building. Multiply the length times width to get the total area of each wall. Keep a record of these numbers. Measure the length and width for each rough window opening on the wall. Multiply the length times width of each window opening. Keep a record of these numbers. Add the total areas of every exterior wall together. This number is the total of the exterior wall space of the building. Add up all the window openings in the building. This is the total window space in the building. Divide the number of the total exterior wall area by the total area of all the window openings in the building. This is the wall-to-window ratio of the building.